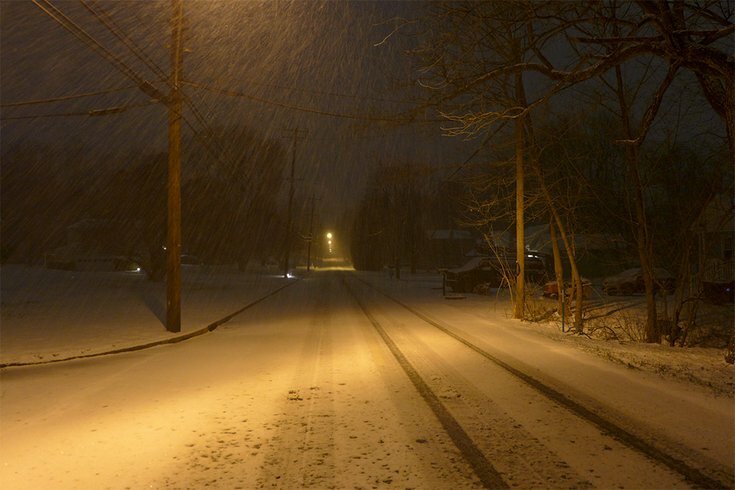 By 1 a.m. Tuesday, the snow was coming down hard and laying on streets in Upper Dublin Township, Montgomery County. The nor'easter called "life-threatening" by forecasters at the National Weather Service in Mount Holly started moving into the region about 11 p.m. Earlier Monday afternoon, forecasters warned people in area to the north and west of the city to "shelter in place" during the storm. It's a storm with three faces, and where you live dictates how scary that face is, meteorologists said Monday. Northwest of I-95 – towns from Reading, Berks County eastward to Somerville, New Jersey, including Doylestown, Bucks County, and north to the Poconos – will see the worst of the storm, and residents were advised to avoid unnecessary travel and shelter-in-place from 2 a.m. to 2 p.m. Tuesday. Many roads will likely be shut down on Tuesday morning as relatively dry snow falls at rates of 3 to 4 inches an hour, with blowing and drifting. Forecasters issued a blizzard warning for eastern Pennsylvania and much of northern New Jersey through 6 p.m. Tuesday, with snow accumulations of as much as 24 inches. Along and southeast of the I-95 corridor, forecasters believe sleet will fall for several hours between 5 and 10 a.m. Tuesday, with one half to 1 inch accumulation possible. That scenario is "playing havoc" with attempts to forecast snow amounts, forecasters said. If there is no change to sleet in this Wilmington-to-Philadelphia-to-New Brunswick watch, snowfall will easily exceed 15 inches. At the Jersey Shore and along the coast, forecasters see enough snow at the start of the storm to slicken roadways, then a change to heavy rain with poor drainage street flooding near daybreak as well as coastal flooding and scattered damaging wind gusts to 55 or 60 mph. Sleet is expected to mix in around noon Tuesday and ends as snow midday or early afternoon. On Sunday, the agency had upgraded the immediate Philly area's status to a winter storm warning as the forecast became clearer. That advisory remains in effect. 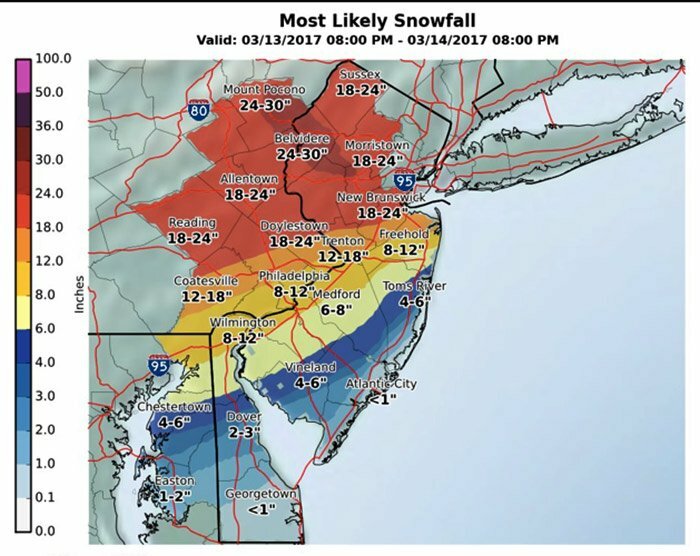 According to the most likely projections, Philly and its surrounding suburbs should see about a foot of snow. Areas south and east of the city have lower projected amounts, while areas north and west have higher projections. In Pennsylvania, the storm will drop as much as 2 feet of snow on Mount Pocono, where the projections peak. Gusts of 50 to 60 mph are likely in the region during periods of the storm. Meanwhile, Philly officials are mobilizing the snow plow fleet in preparation for the storm. Crews will brine limited roads in the city, including Roosevelt Boulevard. The city's Streets Department has 50,000 tons of salt available and will begin salting roads when precipitation arrives. The weather about-face comes a week after the region saw temperatures climb into the 60s. Spring officially starts on March 20. Bank teller Jana White said her plans for riding out the storm include "lots of hot chocolate and a couple of sappy movies." The 23-year-old Trenton, New Jersey, resident said she expects to get Tuesday off work. "It's a reminder that winter is always ready to take shot at you, so you have to stay prepared," she said. "We've got food and snacks and drinks, so as long as the power stays on we should be in good shape."